if you subscribed to email notifications about new entries in polls or new comments, you received so far an email for every new entry. This could lead to numerous emails for polls with many participants. In order to reduce the number of notifications you will from now on receive only one email even if there are multiple new entries until you visit the poll via the link in the notification email. 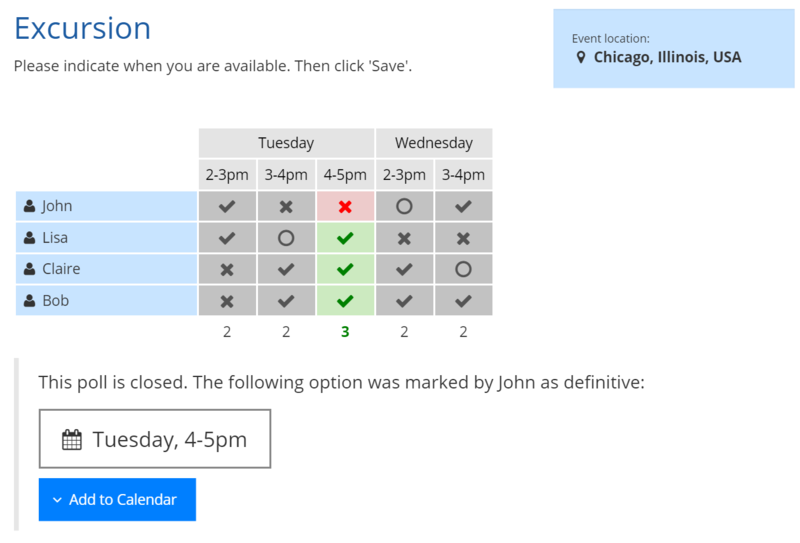 We hope that this makes the scheduling process even more comfortable for you. If you found the best day in your date poll or the best option in your opinion poll you can now finalize it. Just click on the ‘lock’-symbol in the admin area of your poll and mark the best date / best option as definitive. Your participants won’t be able to vote once your poll is locked. If something changes you can easily open it again afterwards and modify it in the usual way. You can now also give your participants the possibility to import the chosen date directly in their Google/Yahoo/Outlook/Apple-calendars. If you have any questions concerning this new feature, please contact us.